A senior official has said the Russian government has deployed “squadrons” of nuclear-capable bomber aircraft to the Crimean Peninsula, which Russia illegally annexed from Ukraine in 2014. Viktor Bondarev, leader of the Russian Federation Council’s Committee for Defense and Security, told the government-owned tass news agency on March 18 that the deployment came in response to the United States’ stationing its Aegis Ashore missile-defense shield in Eastern Europe in 2015. 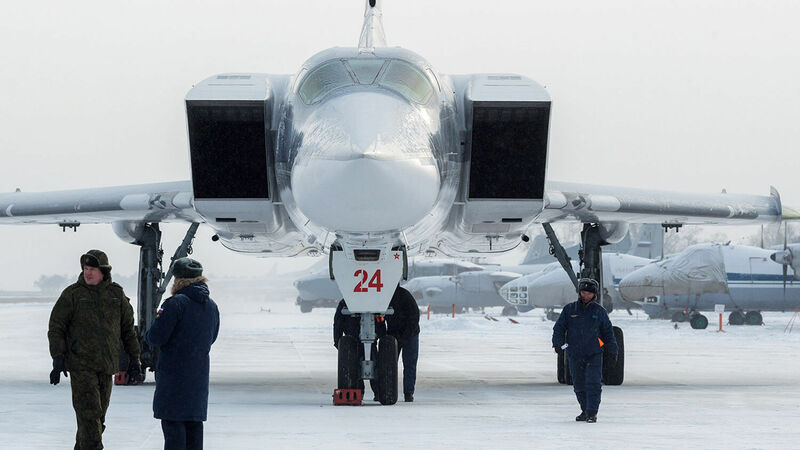 “The deployment of American missile defense systems in Romania came as a major challenge, in response to which the Russian Defense Ministry made the decision to deploy long-range missile-carrying bombers Tupolev Tu-22M23 at the Gvardeyskoye air base,” said Bondarev, according to tass. The Tupolev Tu-22M3s are supersonic strategic bombers designed to carry nuclear weapons. Moscow has not disclosed whether the units now in Crimea are presently armed with nuclear weapons. In either case, the strategic bombers are now well within striking range of several European nations and U.S. Navy carrier battle groups in the Mediterranean. Bondarev said the bombers, along with the Iskander missiles that Russia recently stationed in Crimea, will prevent other nations from being able to “lock” Russia’s Black Sea Fleet out of the Mediterranean Sea. Ukraine’s intelligence data says that since Russia seized Crimea, it has boosted its military power in the region to more than 32,000 soldiers, 680 armored carriers, 170 artillery pieces, 100 warplanes and around 40 tanks. The increased weaponry comes during a time of rising Russian aggression in the area. In November 2018, the Russian Navy illegally captured three Ukrainian naval ships after opening fire on them in the Kerch Strait, which connects the Black Sea and the Sea of Azov. The crew are still being held in Russia. On March 25, the Russian Defense Ministry announced that 1,500 Russian airborne soldiers and 300 military vehicles were sent to the peninsula to join thousands of Crimea-based forces for major offensive operation exercises. Europe’s dreadful fear of Vladimir Putin—its next-door neighbor—is going to help shape and form the Holy Roman Empire rather suddenly. Clearly the concern and fear among Europeans is intensifying. And Mr. Flurry has forecast that this concern and fear will soon develop into something more significant. It will soon go far beyond statements and explode into nuclear world war. These sobering developments will soon escalate into unprecedented worldwide conflict. But there is great cause for hope connected to these trends.